I don’t know about you but I am in full holiday detox mode. So many cookies, so much eggnog … it all leads to the inevitable cleanse/diet/reboot in January. I’m trying to make better meal decisions lately, which led me to research smoothie bowls. I’ve seen them all over Pinterest and I know they were all the rage a couple years ago (I always seem to be late to the trends). A smoothie bowl is a great option for breakfast if you love smoothies but need a little something extra. A smoothie is more like a snack for me – delicious, but not enough to keep me powering through until lunch. The best thing about smoothie bowls is you can completely customize it to suit your tastebuds and diet. They are easy to adapt for paleo, or vegan, or gluten free. 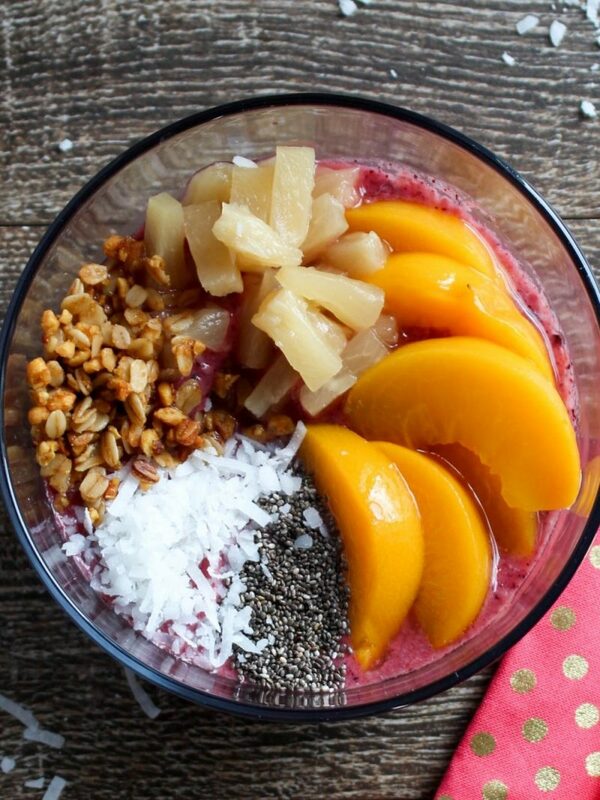 You literally can top your smoothie bowl with whatever you like! For this recipe I partnered with Grocery Outlet, a grocery chain which has recently expanded its locations in Southern California. In fact, we are getting one here in Burbank! I had never heard of the chain before the signs went up in Burbank last month, so I was excited to work with them and get to know their products.